Photo by Mikael Miettinen (2010). As a historical climatologist, I work in an avenue of environmental history that bridges historical and scientific methodology to reconstruct past weather, investigate societal vulnerability to climatic fluctuation, and uncover cultural representations or responses to climate. This is the second in a series of articles that explain how my training as a historian helps me engage in the ongoing discourse about global warming. In this post I’ll explore problems in the understanding of the relationship between society and climate in models of the future and descriptions of the past, before considering how historical climatologists can help forge more accurate visions of humanity on a warmer planet. 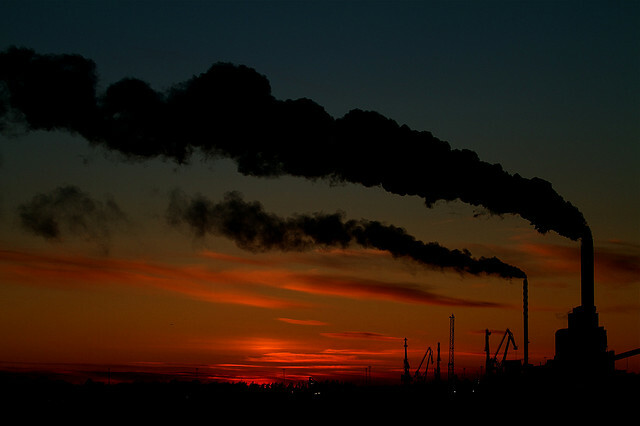 In a recent article for Osiris Mike Hulme argues that conceptions of the relationship between climate and society have been troubled by two opposing fallacies. The first – “climate determinism” – imbues climate with decisive influence in individual and collective behaviour, while the second – “climate indeterminism” – strips climate of all influence in human affairs. Climate determinism has a long history, with roots in the eighteenth-century belief that differences in the world’s climate were responsible for the geographical distribution of contemporary human achievement. Hulme argues that modern scholars perpetuate a new form of determinism, which he calls “climate reductionism,” by using models to predict that global warming will cause mass species extinction, waves of climate refugees, economic collapse and, ultimately, the end of our species. For Hulme, the future political, social, economic and environmental relationships that shape a warming climate’s influence on humanity are unknowable, and no model can chart a calamitous future with so many uncertain variables. Climatic determinism and indeterminism stem not just from our desire to peer into the future, nor our attempts to explain the present, but also from our examination of the past. Hulme suggests that, in academia, geographers have tended to write climatically reductionist histories, while climatic indeterminism has often been the purview of historians. There is some truth to this, but the reality is a bit more complex. The study of past climatic fluctuation naturally involves more disciplines than history and geography, and the rise of environmental history has gradually altered how most historians perceive nonhuman variables. Meanwhile both determinism and indeterminism frequently coexist in the same narratives. Take, for example, anthropologist Brian Fagan’s The Little Ice Age, a popular and beautifully written exploration of medieval and early modern climatic shifts. Fagan opens with a pair of graphs. The first records the fluctuating history of global temperatures over the last millennium, providing a list of “Climatic and Natural Events,” while the second charts the ebb and flow of human history over the same period. The implication is, as Fagan writes, that, “humanity has been at the mercy of climate change for its entire existence.” However, Fagan also insists that, “you certainly cannot argue that climate drove history in a direct and causative way.” How then can we make sense of Fagan’s claim that, “like the Norse conquests, [gothic] cathedrals too are a consequence of a global climatic phenomenon, an enduring legacy of the Medieval Warm Period”? Works of historical climatology that hold determinism and indeterminism in appropriate tension can inform the quest for nuanced and, hopefully, realistic visions of humanity’s future on a warmer planet. The reliance of historical climatology on fragmentary historical documents – in which weather is often an afterthought – to supplement or expand climatic reconstructions developed in other disciplines would seem to stimulate a self-critical understanding of the complexity of the questions we seek to answer. Unfortunately, many studies in historical climatology still lack explanatory models, consider only extremes in agrarian economies, and develop narratives of inevitable decline in the face of climatic fluctuation. This is in spite of the trailblazing work of Christian Pfister and others in the 1980s to formulate models explaining the actual processes by which climate and human history interact. Conceptual models, theories and, above all, an awareness of epistemological assumptions and methodologies can help us realize, for example, that a decade of storminess does not cause a shipwreck. A shifting climate is locally felt through altered regional environments, which can, in turn, kindle culturally mediated weather phenomena that limit or expand the possibilities open to a ship’s crew. Such insights can help stimulate projections of the future that embrace, for example, forms of local knowledge, cultural differences affecting societal vulnerability, and an awareness of the nonlinear course of socio-economic development. With that in mind, it is important to note that works of environmental history and historical climatology that speak to the broadest audience are often those that embrace some level of determinism. Jared Diamond’s Collapse or Guns, Germs and Steel might lack balance, but they popularize narratives that are critical in a time of capitalist overexploitation of the world’s resources. Similarly, the projections that Hulme dismisses might lack sophistication, but the sense of alarm they stimulate and convey is necessary in the face of a climatic catastrophe. Balancing the nuance of our narratives with their ability to reach a wider audience will be one of the major challenges faced by scholars of climates past and future in the decades to come. Dagomar Degroot is a PhD Candidate at York University, where he explores the relationship between the climatic and human histories of the Dutch Republic. His website can be found at www.historicalclimatology.com.